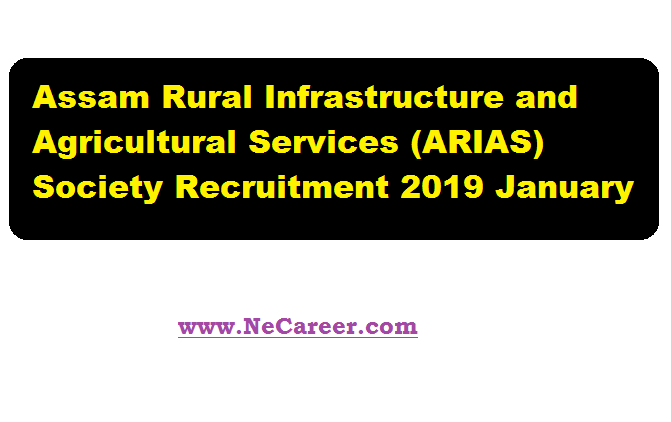 ARIAS Society Recruitment 2019 January | Procurement Management Executive :- Hello dear job seekers.You are visiting North East India's No. 1 Job Portal www.NeCareer.com . Today we are back with a latest govt. jobs 2019 in Assam.Assam Rural Infrastructure and Agricultural Services (ARIAS) Society invites applications for the contractual position of Procurement Management Executive (PME) at the Project Coordination Unit (PCU) under the World Bank financed Assam Agribusiness and Rural Transformation Project (APART). The details of this jobs in Assam can be found below section. Candidates must be Graduate/ Post Graduate from any Govt. recognized University in any subject with in depth knowledge and understanding of World Bank's procurement guidelines and procedures. Experience: At least 3 (three) year of experience In supporting procurement related functions in any World Bank/ Externally aided project or similar Govt. of India/ National level projects, with minimum 1 (one) year in Govt. projects. Interested and eligible Candidates may apply in English language strictly as per the prescribed Application format provided on the website of ARIAS Society along with a cover-let er and supporting documents in an envelope indicating 'Application for the position of________' so as to reach the address given below on or before 05.00 P.M. of 11th February, 2019 and a soft copy (word file only) by mail to recruitments@arias.in before the deadline mentioned. Only the short-listed candidates will be called for interview/test. Address: The State Project Director, ARIAS Society, Project Coordination Unit, Agriculture Complex, Khanapara, G.S. Road, Guwahati- 781022 (Assam, India): Tel: 0361-2332125; Tele-Fax: 0361-2332564.